These bottles have special pumps which produce a thick foam from thin liquid soap. They make a clean, hands free method of getting rich cleansing foam without the use of aerosols or propellants. These pumps are manufactured by Rexam and are the same pump mechanisms used in products sold by Dial, Johnson & Johnson and other major manufacturers. We sell a Natural Liquid Soap for use in the foam pump bottles, but nearly any type of liquid soap, shampoo, body wash or detergent can be diluted to work with the foam pumps. For more information on how to use the bottles, recipes and tips & tricks, see our Foam Pump - Use and Directions page. 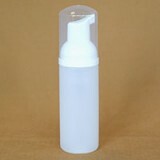 Quantity Discounts Available on all Foamer Pump Bottles. Click on the blue letters or picture to see the quantity price break down.